Should Parents Keep an Eye on Their Kids' Web Search History? Should Parents Keep an Eye on Their Kids’ Web Search History? The internet, as we know it, is a brilliant educational tool that kids are increasingly expected to use to promote their learning. However, the online world has a dark side like never before. Should you be constantly checking your kids’ online activities like which type of web search history they have and their level of participation on social media? Should kids be granted utmost level of privacy without having their parents keeping an eye on their online activities? As a modern-day parent, it is your duty to guard your kids against all sorts of online dangers along with offline threats. However, as each individual has a right to privacy, an acceptable level monitoring needs to be determined, and the sooner you do it, the better. According to a research, 88 percent of teenagers in modern economies between the ages of 13 to 17 have access to a cellphone. Of those teenagers, 91 percent access the internet on their cell phones, tablets and other mobile devices at least once a day. All children have a right to privacy and a right to information. They also have a right to protection from all types of violence and exploitation. While these laws are made by individuals in power who are much older, things are much different on ground with the young generation making its way to Forbes billionaire list and running tech companies that revolutionize the world we live in. Since the young generation is much more internet-savvy than their parents, making sure kids’ online browsing/web search history is secure has become challenging. This can be attributed to the fact that parents these days don’t have an ‘elder’ generation to turn to for tech advice as millennials are already dominating that particular spectrum. As a replacement, many parents turn to parental control software. Let’s take a look at how you can monitor your child’s internet usage. Erick Murphy, a concerned parent, shared his views on using Wouter – a router with a built-in parental control feature that provides secure communications through encryption and online anonymity. “I’m not looking at what my kids are doing on a daily basis, I’m just monitoring their online activities to ensure they’re safe on the web,” he says. Erick emphasized that he uses Wouter’s parental control feature to ensure transparency – something they make sure of in their family. Erick also says that he has made this decision with the mutual consent of his children, who support his monitoring efforts because he is transparent and unbiased about it. His daughter received a message request from some random person and Erick got a notification on his smartphone. When he confronted his daughter about why it’s unsafe to accept message requests from strangers, she understood why her dad was concerned and ended up learning more about online anonymity. Is it ethical to monitor your kid’s online activities? According to cybersecurity experts, monitoring of any kind is an intrusion of privacy as the sole purpose of what they stand for gets undermined if any surveillance activity is being conducted. Parental monitoring may intrude into your kid’s privacy and may be harmful in the long run as it could destabilize a relationship based on trust. Your kids might be using the internet in a healthy constructive way to get information and support, and feel that they are not able to explore anything online because they are being monitored through their web search history and real-time online activities. While this may be a good thing for the parents, it just might end up damaging the kids. However, parents have their concerns about cyberbullying, cyberstalking, online harassment, hate speech and so much more. Melissa, a mother of two young daughters, believes that cyberbullying is a much more common and more significant online danger. But then, she also thinks social media monitoring tools are not likely going to eliminate the problem. According to her, kids better understand and operate technology than their parents ever had. She argues that if parents depend entirely on monitoring tools to supervise their kids, then parents are giving themselves a false sense of security as it will take more than just these tools to prevent kids from accidentally engaging in online risks. Wouter is a Wi-Fi router equipped with parental control and security-centric features that only requires the Roqos Home app and a cable modem from your ISP, which you can simply connect to Wouter. If you have a router/modem combo like in Verizon FIOS service, you can connect Wouter to one of the switch/LAN ports on the router/modem. Learn about how Wouter works. Wouter’s state-of-the-art features allow you to browse the web with complete privacy, security, and peace of mind. Wouter delivers high performance through a lightning-fast processor, dual-band Wi-Fi – providing users with an ultimate browsing experience. Additionally, Wouter promises the strongest and fastest internet connection as five powerful internal antennas included in the Wouter Core remove dead zones within your house. 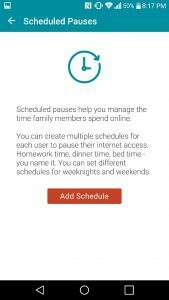 For advanced settings like parental control, Wouter comes equipped with options that allow you to set time zones, disabling or limiting internet access as per set schedules, ticker showing browsing activities of users connected to the Wouter. All in all, charity begins at home and like that, it’s essential for parents to educate their kids regarding online perils and explain to them the necessary measures one should take when going online. If your kids understand your concerns and your need for online monitoring, it’s a win-win situation.